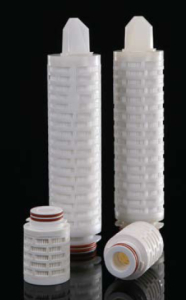 HIGH FLOW TETPOR II gas sterilisation filters have been developed to benefit from technological advances within the manufacture of PTFE membranes. This new generation of filter sets the standard with an unrivalled combination of efficiency, flow rate and strength. The HIGH FLOW TETPOR II is validated as a 0.2 micron sterilising grade filter in liquids through ASTM 838-05 and 0.01 micron in gas through full retention to an aerosol challenge of MS2 phage.